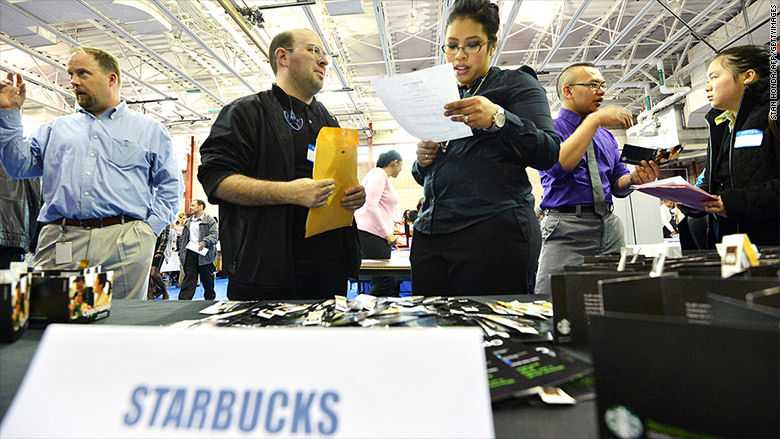 Starbucks representatives speak to job applicants at an employment fair in a youth center in New York City in 2012. A number of leading U.S.-based companies have joined together to hire 100,000 teens and young adults who face barriers to jobs and education. The program is being called the "100,000 Opportunities Initiative" and has set a goal of making the new hires by 2018. Companies involved in the program, aimed at those from 16 to 24 years old, include Starbucks, Walmart, Target, JCPenney, Macy's, JPMorgan Chase and Hilton, according to a joint statement. The initiative will provide "opportunity youth" with access to apprenticeships, internships, and training programs, as well as part-time and full-time jobs. The first "Opportunity Fair and Forum" will be held on Aug. 13 in Chicago and will be hosted by actor and hip hop recording artist Common. The Chicago event will train over 2,000 young participants and at least 200 job offers will be made at the event. The initiative plans to hire around 1,000 young people in the Chicago area within the next 18 months. "By using our scale to create pathways to affordable education and meaningful employment for these young men and women, we're strengthening both our workforce and our economy," Chairman and CEO of Starbucks (SBUX) Howard Schultz said. "The rules of engagement for philanthropy are changing. It's not just about writing a check; rather, our approach is focused on creating a coalition of like minds with local knowledge, expertise on-the-ground and the ability to scale the social impact of an initiative like this to create pathways of opportunity for the literally millions of young people who can benefit from this program." "As one of the largest hospitality companies in the world, we are in a unique position to leverage our size, scale and expertise to close the opportunity gap for young people in a meaningful way," President and CEO of Hilton (HLT) Worldwide Christopher J. Nassetta said.